It's better to be converted to make use of it in Dynamo. It's more like imitating than converting. Gather information from topo mesh, and create a Polysurface which has the same shape from it. 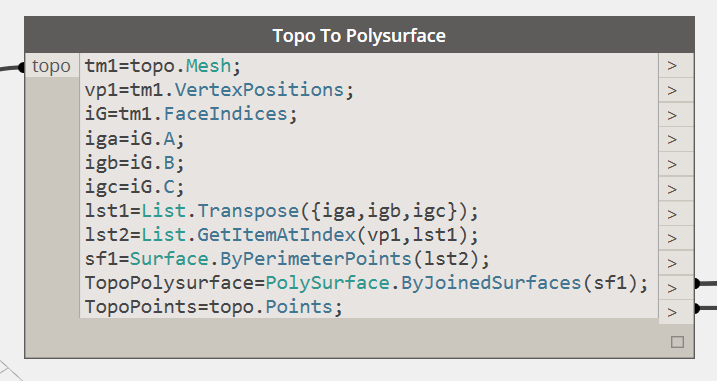 Above will give you a Polysurface from given Topography. 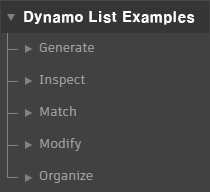 If you want to make your Dynamo graph simpler, use bottom. After convert it, you can do a lot of things with it. These are my Dynamo practices involved with Revit Topography. I know cut volume can be reported by using Graded Region. My dyn generates a cut volume as a 3D geometry with 45 degree cut slope automatically from topography which has several pads. It makes Topography from selected model lines which are at the same level. Maybe, it's not a new feature if you have the new site-tool of Revit 2015. You can download above definitions as usual. Hi HyunWoo , thak you so much for this blog it realy helps a lot! Just have one simple question: Did you run a python script to make "Topo to Polysurface" or there´s another way to do it? No python script necessary for it. is there some code i have to write or edit?